When Dr. Neelan Tiruchelvam, MP was named a President's Counsel in February 1998 it marked a unique achievement in the political and legal history of this country. It was only the fourth occassion that a father and son had received Silk. Neelan's father Senator Murugeysu Tiruchelvam was a Queen's Counsel, who was once the Solicitor-General and a Cabinet Minister. The other members of this elite father and son combination are EW Jayawardene KC and HW Jayawardene QC, HH Basnayake QC and Sinha Basnayake PC, as well as Nariman Choksy QC and Kasi Choksy PC. Unlike in the other cases, both Tiruchelvam senior and junior were legislators. Not only did they receive the highest honour that lawyer is eligible for, but they were both law-makers. The circumstances under which the father and son had received their cherished honours could not be more different. In the late 1950s when the elder Tiruchelvam received Silk Ceylon had the trappings of plural, liberal democratic state. Human rights were respected and inter-ethnic amity was the norm. The Queen was the Head of State and colonial honours were sought after. Plaintiffs had the right to appeal to the Privy council in London . One would be indulging in some post-lapsarian fantasy ignore the disenfranchisement of the Indian Tamils in 1948/49 and the pogrom of 1958. Nevertheless, the atmosphere in the 1950s was decidedly peaceful, inclusive and democratic. The conferment of silk on Mr. Murugeysu Tiruchelvam was hailed by the Colombo elite and the Tamil professional classes. In 1998, when Neelan Tiruchelvam was named a President's Counsel, Sri Lanka had descended into a pitiful morass. Sri Lanka had become a metaphor for violence and abuse of power. The country had disposed of colonial honours as part of the misguided patriotism associated with the adoption of a Republican constitution in 1972. The honour Queen's Counsel had been replaced by President's Counsel, summarized by the curious acronym PC (often confused with polyester cotton and police constable). In line with the countrys decline, PC did not have same resonance and status as QC. In fact, Neelan, a lifelong opposition politician, was nervous that the conferment of PC would associate him too closely with the then President. By 1998, a culture of violence, communalism and authoritarianism had become the norm. The 1983 pogrom and the civil conflict that ensued are the most glaring symptoms of this phenomenon. They are not the sole symptoms. Since the 1970s, successive governments have sought to both abuse power and human rights. The 1971 JVP insurrection was responded to with arbitrary arrests and extra-judicial killings. Earlier this month, an innocent remand prisoner was allegedly tortured to death while in custody. In 1982, the term of parliament was extended through an allegedly fraudulent referendum. The state was not alone in violating civil liberties. Insurgent groups such as the Tamil Tigers and the JVP had shown the same callous disregard for civil liberties. In their protracted struggle, the Tamil Tigers have been blamed for serial assassinations, child conscription and civilian massacres. Dr. Neelan Tiruchelvam, a passionate human rights advocate, fell victim to them in July 1999. One of the most touching tributes to Neelan Tiruchelvam was delivered by the Indian scholar Dr. Veena Das in 2001. She said that Neelan would have been among the first people to lament the death of his unnamed and unheralded suicide assassin. Neelan valued the lives of all citizens in Sri Lanka s tragedy. In one of his last parliamentary speeches he said "We cannot glorify death, whether in the battlefield or otherwise. We, on the other hand, must celebrate life and we are fiercely committed to protecting and securing the sanctity of life, which is the most fundamental value without which all other rights and freedoms become meaningless." With the countrys appalling descent, the idealism of the Tiruchelvams, father and son is the need of the hour. However, opportunism is plentiful and leadership is in short supply. Bickering between the political parties, notably the UNP and SLFP has effectively ended any hope of constitutional reform. All-Party conferences, Commissions and parliamentary committees have been convened, only to end in failure. The state apparatus has a communal feel to it. A single ethnic group comprises over 99% of the armed forces. The constitution awards to Buddhism the foremost place, making the non-Buddhists feel that they are strangers in their own home. Again, the Sri Lankan government is not the sole villain. Both protagonists in the civil conflict, the Sri Lankan government and the Tamil Tigers are given to ethno-nationalism and authoritarianism. If the idealism of the Tiruchelvams should come to the countrys rescue, it will have to be in a very high dosage. The 30th death anniversary of the late Minister M. Tiruchelvam, QC took place recently. Mr. Murugeysu Tiruchelvam QC and former Minister of Local Government and Solicitor-General belonged to a band of men with a vision and a mission. His political sagacity, robust patriotism, practical wisdom and great administrative skill made him one of Sri Lanka's great statesmen. In the political field he was a Cabinet Minister, a Member of the Senate and a leading figure among the people of this country. Mr. Tiruchelvam, who was born in 1907, grew up in Malaya, where his father Mr. V. Murugeysu was an officer in the British colonial administration. Soon after the first world war ended in 1918, Mr. Murugeysu sent his two elder sons Tiruchelvam and Rajendra to St. Thomas College, Mount Lavinia. This move was recommended to Mr. Murugeysu by the son of one of his friends - Mr. S. J. V. Chelvanayagam, an old Thomian who was then pursuing a legal career in Colombo. It was felt that St. Thomas was superior in academic standing to any institution at the time in Malaya, even the famous Victoria Institute. St. Thomas College had an exalted reputation at that time, having been dubbed the Eton of the East. Mr. Tiruchelvam entered politics in the early 1960s after a long and distinguished career as a government legal officer. Having reached the high office of Solicitor-General, he set his sights on contributing to the greater good of the country as a politician. Mr. Tiruchelvam was the chief advisor and principal political strategist of the founders of the Federal Party. Mr. S. J. V. Chelvanayagam, QC. Mr. Chelvanayagam, who was nearly a decade senior to Mr. Tiruchelvam, had played a leading role in shaping Mr. Tiruchelvam's educationl career and legal career. He was the guide and mentor to Mr. Tiruchelvam's foray into politics. His early years were shaped by struggle and civil disobedience. In 1961, a mass satyagraha was staged by the Federal Party to protest against the Sinhala Only Act. Mrs. Bandaranaike's government jailed Mr. Tiruchelvam and more than 30 other leaders of the Federal party in Panagoda for over six months. Today, the mass incarceration of so many political prisoners would be met by international outrage. But the world was different in 1961 and this cruel act of oppression went largely unnoticed. In 1965, the UNP and Federal Party entered into a coalition pact, after the Senanayake Chelvanayagam pact. 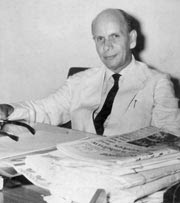 The famous press magnate Esmond Wickremesinghe was the mediator between the two parties. Mr. Tiruchelvam entered the Senate and was named in Dudley Senanayake's Cabinet as the Federal Party nominee. During his tenure as the Minister of Local Government, Mr. Tiruchelvam played a leading role in administrative reforms. He was also instrumental in the passage of the Tamil Language Special Provisions Act and the creation of the Jaffna University. In September 1968, due to the inability of the UNP government to implement the Senanayake-Chelvanayagam pact and a dispute with the Prime Minister, Mr. Tiruchelvam resigned. Incidentally, Mr. Tiruchelvam's deputy Mr. Ranasinghe Premadasa (who later became President) succeeded him as Minister of Local Government. Mr. Tiruchelvam had great confidence in the potential of the youthful Mr. Premadasa. Mr. Tiruchelvam continued in the Senate till its abrogation in 1971. His last years were spent in the context of the worsening ethnic relations in the country, particularly in light of the 1972 constitution. Despite the worsening situation, Mr. Tiruchelvam was resolutely in favour of a united and plural Sri Lanka. He was opposed to the 1976 Vadukkodai resolution that demanded a separate state of Tamil Ealam and advised Mr. Chelvanayagam against it. He died suddenly on 23rd November 1976 at the age of 69. His passing away was a loss to the whole country, because he was a strong voice for peace and moderation. vam.blogspot.com/o make a great impression, so try to give it some oomph! Grab your visitors' attention, and they'll be more likely to explore other parts of your site.